I just spoke to Grammy this evening, and she's doing well. She says hello! Grammy is a fan of pickling odd things -- this recipe is case in point. I'm not sure what this would taste like, nor under what conditions I would try this: maybe if I were on a game show? It just sounds weird. 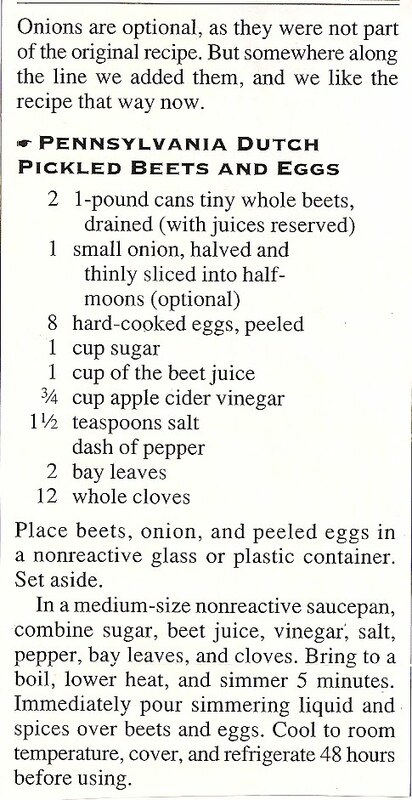 -Put beets, onion and eggs in glass container. -In a medium saucepan, combine sugar, beet juice, vinegar, salt, pepper, bay leaves, and cloves. Bring to boil, then simmer for 5 minutes. -Pour simmering liquid over beets and eggs. So you know, pickled beet eggs are DELICIOUS. I'm from Lancaster, PA (but have lived in NC most of my life). We went home for a family reunion and pretty much everybody made these. I thought they were really weird, too...until I tried them. They are unexpectedly awesome- your grandma's on to something!